AP Open School Society examinations fee schedule of theory examinations of SSC & Intermediate (APOSS) to be conducted in April 2019. The candidates of Inter & SSC (APOSS) who wish to appear for examinations are requested to pay the examination fee as per dates given here under. The candidates have to pay the examination fee through online at Mee-seva/TS Online centers only. Payment through challan or DD will not be accepted.The candidates who have got admissions into the Intermediate and SSC Course and eligible to appear for the Intermediate and SSC Public Examinations as per schedule but could not pay the examination fee in time, can avail the opportunity of “Tatkal Scheme” from as per schedule(official) for paying the examination fee. They have to pay the Tatkal fee of Rs.1000/- for Intermediate and Rs. 500/- for SSC in addition to the normal examination fee. For further details they are requested to contact Coordinator of their respective study centre. A.P.OPEN SCHOOL SOCIETY, ANDHRA PRADESH, GUNTUR. FEE DUE DATES FOR SSC & INTERMEDIATE (APOSS) PUBLIC EXAMINATIONS, APRIL, 2019. 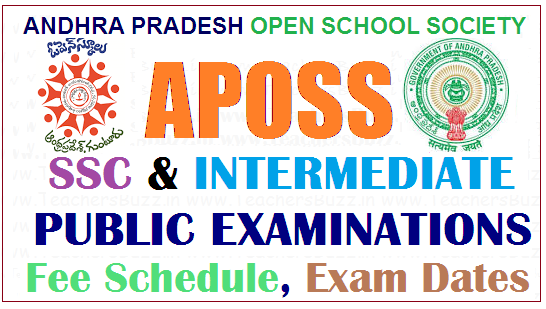 SSC & Intermediate (APOSS) Public Examinations, April, 2019.
i. The candidates who have enrolled during the academic year 2018-19.
ii. The candidates enrolled during the previous years and appeared for the exams but failed. iii. The candidates enrolled during the previous years but not appeared exams so far. 1. Challan/DD payments are not accepted. 2. If for any reason the Government declares holiday on the last date of the examination fee remittance the immediate next working day is to be reckoned as the remittance date. 3. All the PH Candidates are exempted from payment of examination fee. But they have to pay service charges against a receipt duly indicating the subjects that the candidate wish to appear.